Product #16592 | SKU SP2201H | 0.0 (no ratings yet) Thanks for your rating! 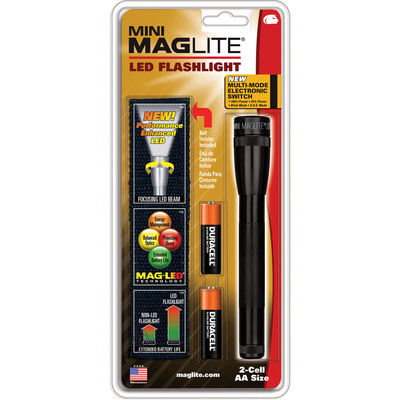 Maglite 's black Mini Maglite 2AA LED Flashlight combines the traditional look and feel of the iconic Mini Mag, with today's LED technology to create a powerful illumination tool with additional safety features. It features a high output of 75 lumens and a low of 19, with a blinking signal and an emergency SOS mode. The output is digitally regulated to ensure consistent beam intensity throughout the life of the batteries. Activation is as easy as twisting the head, and a simple adjustment changes the beam from spot to flood. Designed for durability, the lightweight and rugged aluminium housing features a scratch and corrosion-resistant black anodised finish. O-rings seal the housing to be weatherproof, and the light is impact resistant to 1 m. Power is supplied by two AA alkaline batteries which last up to 18 hours in high mode and up to 32 hours in low. The Mini Mag comes ready to work in clamshell packaging with two batteries and a black nylon holster.